Little is known of Gitane models which pre-date the late 1960’s. There are few, if any, specimens in existence in the USA, and more information is welcome regarding the bikes of the 1940’s, 50’s and early 60’s. However, starting in the late 1960’s, Gitane began exporting large quantities of lightweight “racing” bicycles to the USA. Of particular note were the two high-end models, the “Tour de France”, an upper-level racing bicycle similar to Peugeot’s PX-10, and the “Super Corsa”, which ranked with many high end custom bicycles, but lacked the attention to detail and nice finish of the Italian racers. What makes French bikes so difficult and “untidy”, for lack of a better word, is the fact that they were often sold with parts other than what was listed in the catalogs. It seemed that the company would build bicycles with whatever parts were on hand. However, Gitane fans actually appreciate the quirks of their bicycles and take pride in the fact that theirs are not the “prettiest” machines! 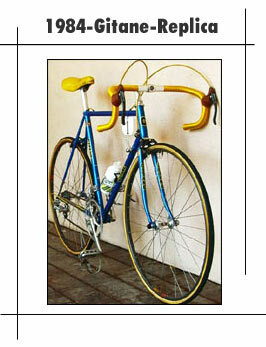 Gitane was a “blue collar” bike, true to the traditions of French cycling.